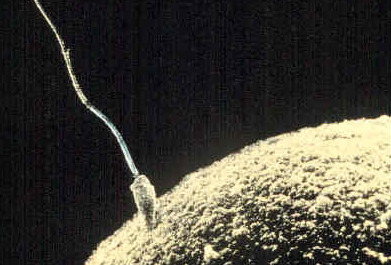 Mammalian reproduction begins when a sperm cell combines with an egg cell to become an embryo. This process cannot begin until the sperm cell and egg cell recognize each other. The cells do so through the linkage of two proteins, one on sperm cells and one on the egg cell. The protein Izumo, found on the sperm cell was discovered in 2005 by Japanese biologists who named it after a Japanese marriage shrine. The second protein, found on the egg cell, has remained a unidentified until now. Scientists at the Wellcome Trust Sanger Institute discovered a protein that binds with the Izumo protein at the moment of conception. They’ve named the protein Juno after the Roman goddess of fertility. The pairing between Izumo and Juno begins a process where the Juno protein disappears from the surface of the egg and prevents further sperm cells from recognizing the egg. Their discovery was published in Nature on April 16, 2014. The researchers developed mice who would lack the Juno protein and found all female mice were infertile. The same was true for male mice lacking the Izumo protein. This discovery could lead to new methods of treating infertility or developing new contraceptives. The Sanger Institute is currently investigating the possibility of creating a simple genetic screening test to test for infertility due to the lack of Juno.